There was a time when a kitchen faucet was a simple piece of equipment to enable water-flow, remember? Now, things have changed and you use kitchen faucets for a variety of needs — ranging between filling a glass and washing some vegetables. 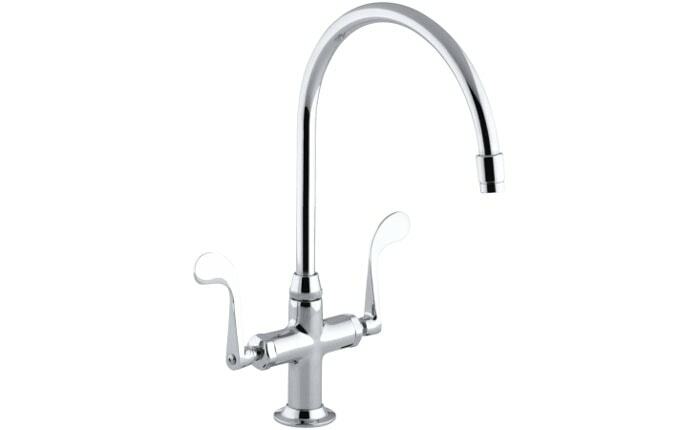 Because of the same reason, there’s a wide variety of kitchen faucets available in the market. If you are building your home kitchen or renovating it, you should know which kitchen faucet is the best to choose. In this article, we have something quite helpful. We will be talking about the many types of kitchen faucets, their advantages, disadvantages and the ideal purpose for which they are made. You would be able to pick the right one after reading this, that’s sure. Note: You can classify kitchen faucets based on a variety of factors. For instance, you can consider the design, the intended use and some features that matter. Our classification isn’t criterion-specific, though. It means you will find some cool kitchen faucet types from all scenes. The single-hole kitchen faucet is a type of kitchen faucet that is quite common and easy to install. It requires the sink to have a single hole, to which the faucet can be connected. As it happens, these faucets will have just a single handle, which allows you to control water-flow as well as temperature. Just so you know, a common American kitchen would have a sink with a single hole. The commonness of the design doesn’t necessarily mean a compromise of features, though. Depending on how much you can spend, a single-hole kitchen faucet can offer a variety of features including touch-based control. Another great part about single-hole kitchen faucets is that you can get them in different designs. Because the installation process has been kept to the minimum, manufacturers tend to focus on the design. You will easily get a faucet that blends with your kitchen interior. Easy to find and install within your sink. Doesn’t require drilling your sink. Quite affordable but has an elegant design. Single-Hole Kitchen Faucet is the best choice if you need a simple yet effective kitchen faucet for home. A double-hole kitchen faucet is often seen as the better alternative to single-hole ones. This type of kitchen faucets has been designed so that users can easily choose between hot and cold water. The faucet will have dedicated handles for two types of water. The constraint here is that you will need two holes for connecting the kitchen faucet. It’s great if you already have a sink with three holes, but you may have to drill them otherwise. We don’t see that as a problem when you are building the kitchen, though. While double-hole kitchen faucet can offer more control and convenience, these faucets are relatively bigger in size. You cannot use them in a smaller sink, for instance. Another problem is that you cannot find so many advanced features in this category. Reduces the chance of accidents. Requires more than one hole on the sink. A double-hole kitchen faucet is recommended if you don’t mind dedicating extra space for convenience. There are times when you need an extra hose with the kitchen faucet. Nevertheless, you may not find it the best solution to get a faucet with detachable sprout. And, this is when you should consider getting a kitchen faucet with side sprayer. While the faucet works as the normal way to grab hot or cold water, the sprayer would have a dual function. You can swivel it according to your convenience but you can also extend the hose to meet other needs such as washing some dishes or something. Another advantage here is that you don’t have to worry about hygiene issues. 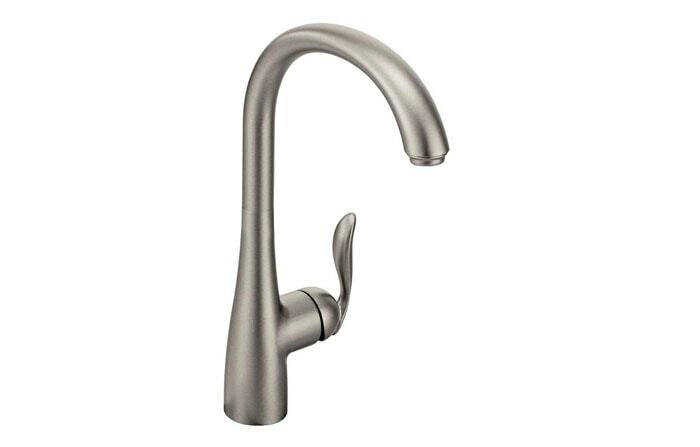 The faucet and the detachable sprout don’t come in contact, making way for less contamination. In addition to this, this type of faucet looks very aesthetically pleasing on almost every interior. You get a dedicated sprayer for needs. The design does not compromise hygiene requirements. Offers the best level of convenience. May cause water splashing incidents more often. Installation requires more effort and holes. A kitchen faucet with side sprayer is the best choice if you want to combine convenience and hygiene. 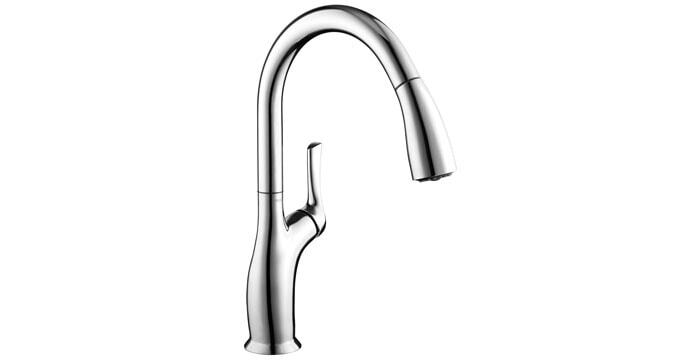 As you may have guessed from the name, pull-out kitchen faucets have a detachable sprout. The sprout can be pulled down from the faucet according to your needs. It means that you can use the same faucet to do a lot of things like washing dishes, filling water and thorough cleaning. Versatility is the reason why most people purchase pull-out kitchen faucets. The sprout comes with a quite extendable hose that lets you clean dishes and even the normally-unreachable parts of the sink. Most of the products now have advanced features like different spray modes as well. Because this type has become so common, you can find some great design choices in the market. It should also be noted that a pull-out kitchen faucet saves a lot of space, since both the spray-head and the faucet is taking water from a single hole. Offers the best level of flexibility. Versatile design with advanced features. Saves a lot of space in the kitchen. Causes water splashing more often. The Pull-out kitchen faucet is the best option if you need a versatile and convenient design. Pull-down kitchen faucet and pull-out kitchen faucet are almost the same. In the former, however, the sprout moves towards the bottom part of the sink. That is, you are pulling the sprout down. This type also offers a lot of flexibility. Coming to versatile use, however, there may be some limitations. As you are supposed to pull down the handle, you don’t have much of movement sideways. Also, you are likely to face some other issues if you’ve a smaller-sized sink in the kitchen. It should be noted that there is no separate hose for the sprout, but a docking-based extension. It also means that the sprout would quickly go back to the sprout — as soon as you leave it. As far as usability goes, though, it won’t be a hindrance. It can reach even some tough areas of the sink. Does not cause much water splashing when compared. Docks with the faucet so smoothly. Doesn’t offer the maximum flexibility. Not suitable for sinks of smaller size. We’d recommend pull-down kitchen faucet if you have a smaller sink but need versatile use of the sprout. 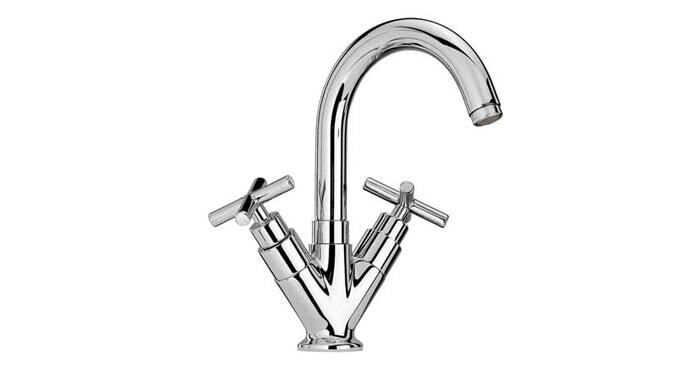 A commercial kitchen faucet is not classified by the peculiar design, but by the purpose it is made for. 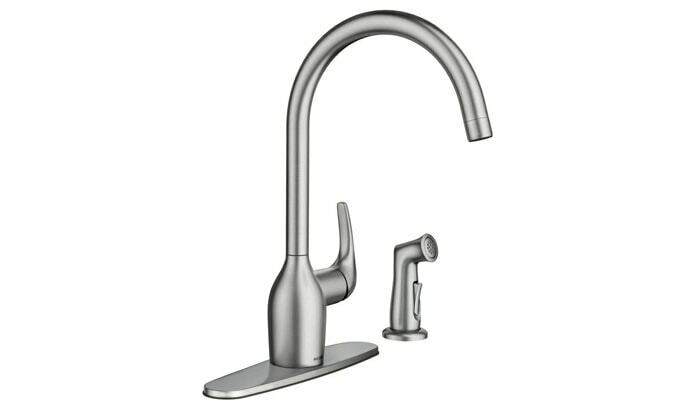 This type of kitchen faucet has been made for extensive use in a commercial scenario, like a restaurant or a home that has so many members. Accuracy and Durability are two of the major things that commercial kitchen faucets offer in the front line. As a chef, you would not have to worry about leakages, water splashing or anything. At times, these products also come with features for extra productivity. Compared to normal faucets, these are bigger and better — no wonder. So, if you want to have one of these faucets, make sure that you have a bigger sink. It should be noted that these products may not have those fancy features inside. Definitely the best choice for professionals. These faucets last longer and stronger. If you need a professional-quality water-management solution in the kitchen, you should get one of these. Once again, you can guess the design from the name itself. Instead of making holes and attaching them on a sink, wall-mounted kitchen faucets can be attached to the wall. It means you are not taking up much space from the sink area. Compared to other types of kitchen faucets we have seen so far, wall-mounted ones are available in different colors and flavors. You would be able to choose one that goes with the kitchen style. That having said, you’ll have to compromise in some areas. For instance, don’t think that the wall-mounted kitchen faucet would offer much versatility. You can’t expect many fancy features either in the package. Also, you would need professional help while trying to install this faucet at your home. They take up less space. Offers a wide variety of designs and features. Saves space on counter-top and easy to clean. Comes with a tough installation process. Not recommended for existing kitchens. If you want to save space without compromising the functions a lot, you should go for wall-mounted faucets. This is another type of kitchen faucet that can make things better. As you would have guessed, this faucet is having two handles but a single hole. You don’t have to drill an extra hole on the sink just because you want to control hot and cold water. Instead, the faucet manages to accommodate both via a single hole, which is great. Depending on the handle you use, you can get hot or cold water through the sprout, which is directly attached. In simpler words, this type is bringing two great things into the bowl. 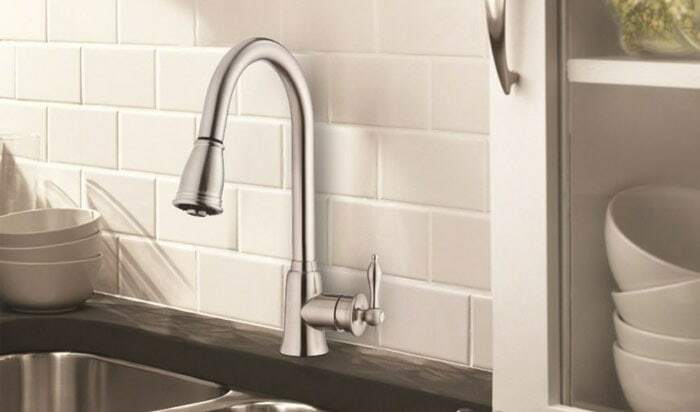 Unlike your typical notion, installing a two-handle single-hole kitchen faucet is an easy task. Most of these are equipped with a DIY system, and the package comes with all the components as well. 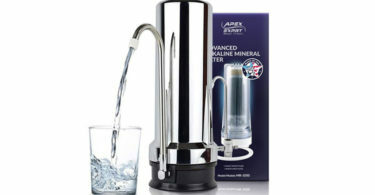 After all, it’s really great that you can manage water flow and temperature using two handles. Comes with two separate handles. Offers a simple installation process. Doesn’t offer much variety of designs. If you want the privilege of multiple handles without drilling for extra holes, this type of faucet works well. 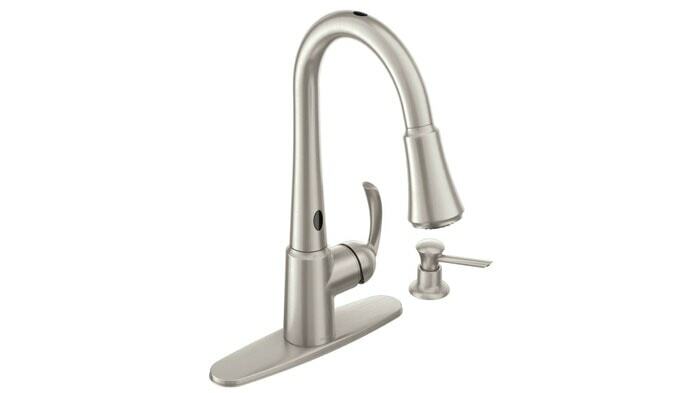 Touchless kitchen faucet is one of the most popular categories when it comes to this product. As the name says, you don’t have to touch on the faucet for toggling the faucet. Instead, these faucets make use of some sensors all along. These sensors will detect the presence of things nearby the faucet and turn on the water supply. So, you will not have to mess up the faucet handle-bar the next time you want to wash your hands after food. Almost all the products come with an additional handle, which can come in handy. Depending on the product you have chosen, it may have some batteries inside or you may have to connect it to an AC power source as well. In either case, these faucets would become one of the best ways to handle water-supply without being worried about hygiene. Easy to use without messing up the hygiene part. Available in a variety of designs like pull-out and pull-down. Adds charm to your smart kitchen. Potential water damage is seen in these faucets. 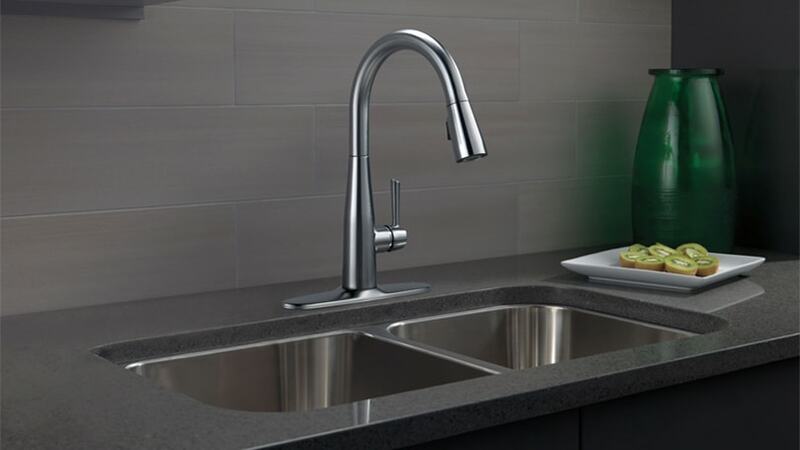 Touchless kitchen faucets are great when you want a smart kitchen faucet that doesn’t cause hygiene issues. 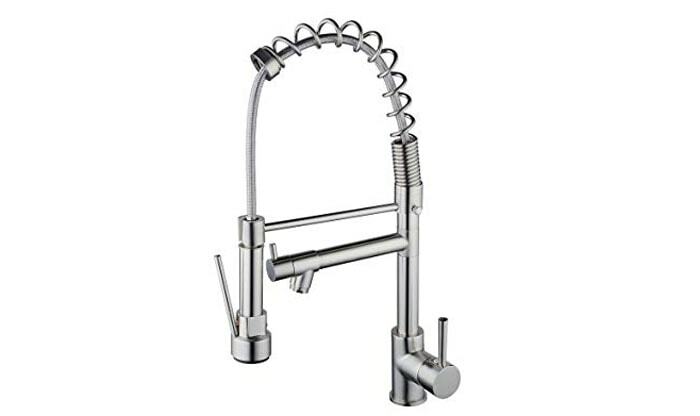 This is another variety of smart kitchen faucets out there. In this case, you have to tap on the faucet to start or stop the water flow. As you can see, the faucets make use of tap-sensors instead of presence-sensors. It means the faucet will waste less amount of water. Here too, you don’t have to worry about the hygiene aspect, you know. You can actually use your arm to tap on the faucet and start the water-flow. Like the other faucets we have seen, these too come with a dedicated handle, used for temperature control. One of the major advantages is that you don’t have to worry about water wastage. 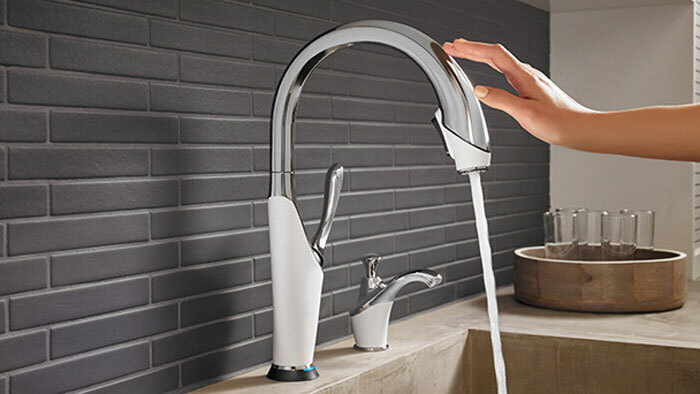 Because the water-flow starts when you tap on the faucet, there is no automated water-flow. These faucets are often equipped with a few extra features like a temperature indicator as well. Simple touch-based toggling of the faucet. It keeps the faucet from becoming dirty. Often comes with advanced features. Quite expensive than normal faucets. The battery-powered system means you’ll have to replace often. All in all, touch on kitchen faucets are great if you need a smarter way to get water, without wasting water. 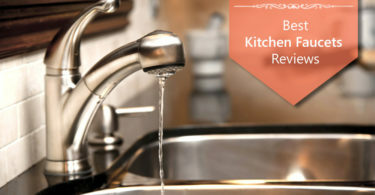 We have said this earlier: choosing one of the best kitchen faucets can make a lot of difference. It can not only make things easier for the user but also save a lot of water. For instance, when you go for a touch-on-powered kitchen faucet, you tend to lose less water. Similarly, the better durability and construction means there will be fewer leaks and less frequent replacements. To sum up, choosing the most suitable type from the kitchen faucet store would really help you in the long run. MyHomeAppliances is a participant in the Amazon Services LLC Associates Program, an affiliate advertising program designed to provide a means for website owners to earn advertising fees by advertising and linking to Amazon (.com, .co.uk, .ca etc) and any other website that may be affiliated with Amazon Service LLC Associates Program. John has been working in consumer appliances store for past 16 years. He is very passionate about his work and looking for various appliances reviews from his customers in those years. He loves to write well-researched articles on various home appliances. Subscribe to the free newsletter now. Copyright © 2019 MyHomeAppliances. All Rights Reserved.